THE BLOG ARCOORLO GUANTANAMERO ,CUBA: THE GODDES DIES YOUNG: MAMA CASH ELLIOT. Secund Part. THE GODDES DIES YOUNG: MAMA CASH ELLIOT. Secund Part. THE GODDESS DIES YOUNG: MAMA CASH ELLIOT -Second Part. 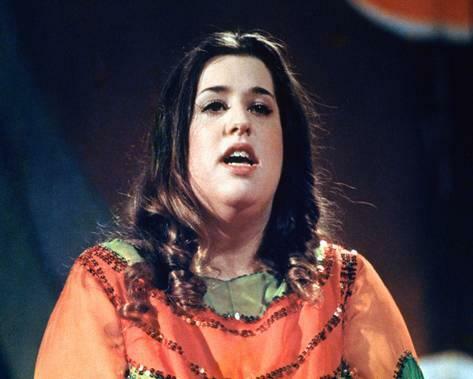 Mama Cash Eliot from the set of 60 "the Mamas and the Papas"
Eliot, famous for her sense of humor and optimism, was considered by some to be the most charismatic member of the band; her unmistakable voice was a great contribution to her triumph. She is remembered by her in the classic songs California Dreaming, Monday, Monday and Words of Love, and particularly for the single Dream to Little Dream of Me, Elliot's version is known to be a ballad, while almost all Dream recordings a Little Dream of Me (including one by Nat King Cole), were fast songs. This song had actually been written in 1931 on purpose for the clubs of that time. They continued recording to fulfill their contractual obligations with the label until their last album was released in 1971. According to the most controversial versions, the abuse of drugs, jealousy, alcoholism and weight problems of Cash Elliot were the triggers of the Subsequent rupture of the group. On the other hand, the singer wanted to become independent from her classmates to start a brilliant (albeit brief) solo career. At the height of her solo career in 1974, Cash Elliot made two weeks of sold-out shows at the London Palladium in the United Kingdom.She phoned Michelle Phillips after finishing the concert on July 28, totally euphoric, and told him that she had received big ovations every night. The singer retired to rest later and a few hours later she died while she slept, at the premature age of 32 years. Forensic sources declared that her death was due to a sudden heart attack. Although the official cause of death was attributed to a devastating heart attack, a repeated urban myth indicated that Elliot died of suffocation by a ham sandwich sandwich. The story began after the discovery of her body and was based on an initial speculation of the media. The police had told the press that they found a half-eaten sandwich in their room and that it could have been the culprit of her death, even though the autopsy had not yet taken place. However, post mortem examinations concluded that Elliot had actually died from a heart attack, and no food remains were found in her trachea. But the story that he had choked has persisted in years after her death. On the other hand, the doctors did not find traces of the presence of any drug that could cause this cardiac crisis. Although he was not known to have any major health problems or drug use in the days leading up to the incident, there are several reasons why the singer died so young, including the stress caused by her hectic pace of life, inadequate nutrition and, above all, excessive obesity. Although some sources claimed that his death was due to a myocardial infarction or heart failure, her official death certificate attributed the fact to a "fatty degeneration of the myocardium due to obesity," a form of steatosis. Anthony Kiedis of Red Hot Chili Peppers quoted The Mamas & the Papas and Elliot, especially as an influence, in an interview for Rolling Stone magazine. He said: "There have been times when I have been very down and misplaced in my life, and the sound of her voice has a kind of sense that has given me a reason to want to move on." Boy George and Lang also cited her as an influence. George described her as "the greatest white female singer that has ever existed." "Beth Ditto, the singer of the band Gossip, has called Elliot, as an inspiration in both music and fashion, saying:" I really wanted to sound like Mama Cash growing. " In 1999, the Rock and Roll Hall of Fame included Cash Elliot and his bandmates from The Mamas and The Papas. In the absence of the singer, her daughter Owen represented her and accepted her posthumous award. By that time, she was the only deceased member, followed later by John Phillips (2001) and then Denny Doherty (2007). Four years later to the death of Cash, the drummer Keith Moon of The Who would die in the same place and in quite similar circumstances. Not only happened in the same place, 12th floor of 9 Curzon Place, but also in the same bed and at the same age. Mama Cash Elliot was a sweet-voiced Jewish woman with a good record and that was demonstrated when she separated from Los Mamas and the Papas and started an independent career. Her voice full of matias if lullaby a growing baby, will endure as the singer who still had much to give the world with her talent and charisma, but we all remember her as "the cheerful fat girl who stood out in the group" and we pay little attention to her affectionate voice, sweet and exalted.